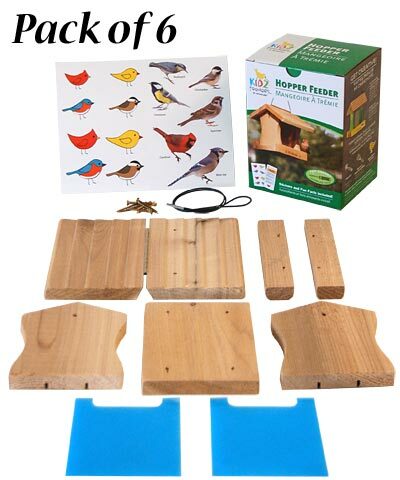 Awaken childrens' interest in birding and woodworking with these Woodlink Classic Hopper Feeder DIY Craft Kits. This set of 6 kits is fantastic for scouting or church youth groups, offering a wonderful craft that celebrates the natural world. Each kit provides precut wood pieces and plastic panels, for building a traditional hopper feeder easily. The components connect together using only a screwdriver, while included stickers allow the builders to customize their piece. The wooden sections can also be painted, for a further personalized look, and a booklet of fun facts about birds offers an educational element. Once built, each center reservoir holds 1 quart of mixed seed, and the lapped roof protects the treat from rain and snow. Included cables enable you to place the feeders on a hook or bracket, and one side of each lid lifts for refilling. The wooden frames offer durability and versatility, and the classic shape adds a timeless look to your yard. Help a few children enjoy bird feeding and building with these Classic Hopper Feeder DIY Craft Kits. Assembly required. Made in the USA. Note: This club package contains 6 of the Woodlink Classic Hopper Feeder DIY Craft Kits.